Allow us to replace your iPhone 4S screen and your glass rear cover with brand new parts, making your iPhone 4S like new again. As the rear case of the new iPhone 4S is glass, like the screen when dropped both do tend to break, we offer a low cost combined repair service, should you need a new screen and rear glass cover for your iPhone 4S. * Our normal repair turnaround times are 3 - 5 working days. We always aim to complete repairs as fast as possible. 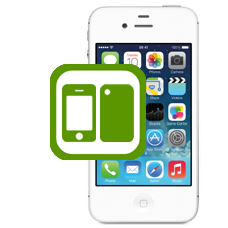 This is an in-house Apple iPhone 4S repair service, when ordering this service you are required to ship your iPhone into our repair centre for works to be undertaken.